From Thursday, 4 May 2017, to Friday, 5 May 2017, more than 140 Ministers, Deputy Ministers, and Ambassadors from over 100 countries gathered together for the High-Level Segment of the 2017 triple Conferences of the Parties, under the theme “A future detoxified: Sound management of chemicals and waste”. 1. With the adoption of the 2030 Agenda for Sustainable Development and the Sustainable Development Goals, the political momentum for a detoxified planet has increased, and this window of opportunity must be seized. 2. There can be no sustainable development without a commitment to a pollution-free planet, and this requires sound management of chemicals and waste. 3. The key to a detoxified future is by taking action now, and the implementation by all parties of all the provisions of the Basel, Rotterdam and Stockholm conventions, which should be translated into national legislation, policy and actions. (a) The sound management of chemicals and wastes is central to achieving the three dimensions of sustainable development, and should be dealt with as a priority, as well as, in a mutually supportive manner to achieve the 2030 goals. It is also central to addressing poverty, food security, access to water, achieving human rights and gender balance, particularly for women, children and vulnerable populations, and is linked to addressing climate change and the protection of biodiversity. With the obvious linkage between the Sustainable development goals and the conventions, and its many cross-sectoral aspects, chemicals and wastes related Sustainable development goals cannot be achieved without the implementation of the conventions. (b) The 2030 Agenda provides a unique opportunity for mainstreaming chemicals and waste related issues into national sustainable development plans, and for the development of business cases for sound management of chemicals and wastes. Institutional frameworks must be strengthened at all levels and policy coherence achieved across all sectors. This requires strong political will, cooperation, as well as community and end-user awareness, including partnerships. (c) Furthermore, the 2030 Agenda provides specific targets which support the commitment for sound management of chemicals and wastes in order to protect human health and environment. The importance of increasing efforts to achieve the Sustainable development goals is clear through a focus on poverty reduction strategies recognizing that the poor are the most affected by pollution including extensive use of chemicals in agriculture. (d) There is a need for greater commitment by industry to prevent pollution of streams and water bodies on which communities depend, especially those in abject poverty. Industry must play a more proactive role in achieving the sustainable development goals. (e) Different levels in development and differing capacities among countries to address the challenges of chemicals and wastes management must be recognized, particularly in small island developing states, least developed countries and other vulnerable populations who have limited capacity or access to information to deal with environmental challenges. (a) Increased cooperation and coordination is needed at the national, regional and global levels to implement the Conventions effectively. Partnerships have a central role, and civil society, business, industry, and private sector investment must be fully involved and engaged. 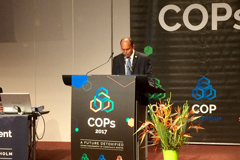 (b) Partnerships have proved to be useful tools in the implementation of the chemicals and waste agendas and should be further encouraged. Multistakeholder partnerships, including those with the private sector, should be strengthened to promote new technologies, win-win partnerships and innovation in support of the implementation of the Conventions. (c) Partnerships must be established with all sectors and stakeholders including with local communities and municipal entities. A bottom-up approach is essential as citizens are the key driver for action. Regional networks can assist in monitoring and managing cross border issues and civil society groups can help governments monitor their environment. (d) The Basel and Stockholm Conventions regional centres and national institutions are uniquely positioned to deliver synergistically on chemicals and wastes by engaging in capacity-building and catalysing the transfer of technology for the sound management of chemicals and waste at the national level. (e) Availability of, and access to adequate financial resources are fundamental in order to ensure the restoration of our oceans and landscapes from chemical pollution and for the adequate implementation of the chemicals and wastes agenda within the framework of the Sustainable development goals. (b) Commitment to, and conscientious implementation of the chemicals and wastes conventions contributes to the achievement of environmentally sound management of chemicals, the reduction of illegal waste traffic and pollution nationally and across borders thus enabling economic and social prosperity. (c) Awareness raising of the interlinkages between the conventions and issues such as air pollution, plastic pollution and marine litter increases the visibility of the chemicals and wastes issues in a simple manner to stakeholders, the media and schools, thereby enhancing the Conventions’ contributions to the achievement of Sustainable development goals, the protection of human health and the environment. (d) Adequate technology transfer is essential to address sustainable development in fields such as agriculture, recycling technologies, household and medical waste management, as well as training and capacity-building in chemicals and waste management throughout the lifecycle. Legislation and control techniques should be in place in all sectors, as there is limited enforcement even where such regulations exist. (e) Lack of financial resources, as well as, limited institutional capacity are legitimate concerns which require attention. Further scientific research is also needed in developing countries along with associated funding for national coordinating units, laboratories and research institutes to develop and adapt new technologies for chemicals and wastes management, to establish baseline data, develop viable alternatives, promote science based decisions, and enhance monitoring capacity and database management skills in order to monitor progress in the targets of the Sustainable development goals. (f) Mechanisms should be established to implement the polluter pays principle, with economic and policy incentives and disincentives, taking into consideration the specific situation of each country. (g) Formalization of the informal recycling sector is fundamental for the creation of decent jobs, and the reduction of legal and also occupational risks and environmental impacts. There is a large potential for recycling to have positive economic impacts in developing countries. This must be guided by strong regulatory frameworks and technical expertise to ensure that wastes destined for use as a resource do not have an impact on health and the environment. (h) Concepts such as the circular economy and the green economy are models that provide opportunities for developing countries to reduce waste and pollution while enabling economic and social prosperity and that also requires behavioural and cultural adaptations. (i) Industry should be encouraged to develop chemicals and products based upon green and sustainable chemistry principles taking into account the precautionary principle, in particular in the case where persistence, bioaccumulation and long range transport are of concern, in order to prevent further damage to health and environment.